‘The Crest’ with the Best Overall Display Award. 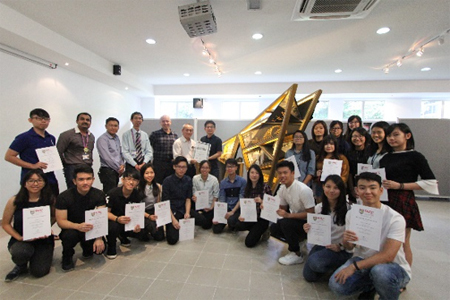 The team which brought home the top spot in the competition showing off their certificates of achievement received from Datuk Dr Tan Chik Heok (standing sixth from left), President of TAR UC, alongside Sr Ooi Lay Yong (standing fourth from left), Dean of the Faculty of Built Environment (‘FOBE’) and academic staff of FOBE. 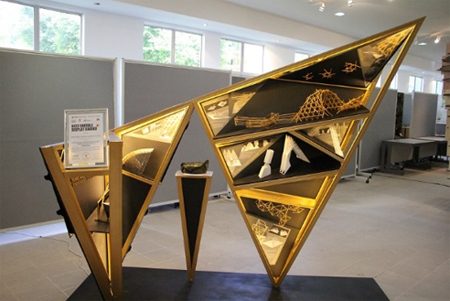 Unleashing their high levels of creativity, 27 TAR UC students earned themselves the spotlight at the annually held Pertubuhan Arkitek Malaysia (‘PAM’) Architecture Student Works Exhibition 2017 when they were named as the recipient of the Best Overall Display Award. The theme for this year’s competition was ‘Structura’ and the students beat entries from 21 other institutions to be crowned the top position on 15 October 2017. All 27 students are currently pursuing their second year of the Bachelor of Science in Architecture (Hons) and the group leaders are Tan Chor Aik and Tiu Lean Kai. Their creation is called ‘The Crest’, which is designed after the ‘Tengkolok’, a formal headgear worn by Malay rulers for royal ceremonies or grooms for wedding rites. The team got the inspiration to develop a structure based on the ‘Tengkolok’ in conjunction with the nation’s 60 thNational Day, as the ‘Tengkolok’ was worn by Yang di-Pertuan Agong Solek Dendam Tak Sudah, exemplifying the personification of the will to defend and protect the country. “The competition was definitely a great platform for us to apply the knowledge and skills we have gained from our studies in diploma and bachelor’s degree in TAR UC. As the structure that we built is also our coursework assignment for the Design Studio 4 subject, we wanted to ensure that our creation has a distinctive uniqueness not only to its shape but in what it represents. Under the guidance of our lecturer, Ar Lee Chor Wah, we were inspired to build ‘The Crest’ which is a modern and elegant structure that epitomises an important symbol in Malaysia,” Chor Aik shared. Many would assume that with a big group of students, it would be very challenging in terms of coordination. “The challenges we faced were not the expected ones such as team coordination as we elected 2 group leaders which is myself and Lean Kai to oversee two main areas for this project. These two areas are firstly the presentation of the overall structure and communicating our idea to the judges and visitors which was under my care while Lean Kai focused solely on the design and construction of the structure. The challenges we faced were more technical and we did not have prior knowledge on the lighting for the structure. That did not stop us from doing extensive research and experimenting with different lightings before confirming the best type of lighting and installing them onto the structure,” Chor Aik further explained. This year’s competition contained a new element which was video presentation. The students had to produce a video which clearly illustrated the structure they had built and highlighted the important elements of the structure. On top of this, the students were caught off-guard when the judges requested them to do a short presentation about their structure during the exhibition. “It was a frightful surprise but thanks to my experience in developing the video content for ‘The Crest’ and the many times that I needed to do presentations in classes, we succeeded in delivering a satisfying presentation for the judges,” Chor Aik recalled.